The Giant Google released this new trick in it's homepage. Just go to google.com and type "Google Gravity" in the search box without the quotes and click I'M FEELING LUCKY. 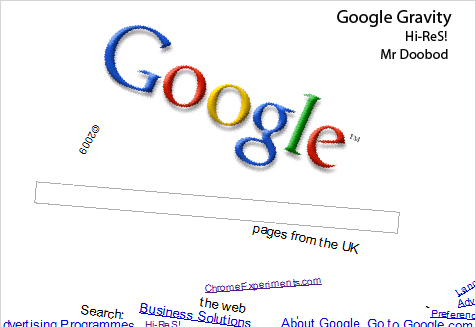 As I said earlier This new Google Chrome experiment causes the Google homepage search screen to collapse, as if being pulled under the weight of gravity. If the above method does not work click here to go to a link. Immediately after going there the homepage elements will fall down and you can start tossing them around! !